In the beginning, the world was attacked by monsters. During the attack, the world started to become uninhabitable by anything but monsters, due to the blood of monsters mixing with the water, making it undrinkable. Luckily, some god-like beings descended upon the world, and raised masses of land on top of four pillars. Alvastia Chronicles begins with one of those pillars somehow being attacked by the monsters once again. Our protagonists were among some of the few survivors, and we gain control of the pair 10 years later. On a routine patrol, the pair run into the leader who attacked their home, and swiftly beats the two, though allows them to escape with their lives. This sets the duo off on an adventure to gather a force to save the pillars, and hopefully the world, from this evil monster threat. This is a pretty barebones and average JRPG story, with nothing really unique happening here. Everything is by the numbers, from travelling all over the world, to beating four lieutenants before taking on the big bad. Being run of the mill also makes the story uninteresting, and I found no investment at all in what was going on here. To make matters worse, the story starts with some auto-skipping text, which left little time to read what was on screen, forcing me to miss most of the back story. What happens does come up hours later, but it meant that I had no incentive from the beginning to care about what was going on. A poor story can be made up for with a strong cast of characters, and sadly Alvastia Chronicles doesn’t have the personalities to carry it. Each character is basically a JRPG trope, with no real defining personality of their own. You have the flirtatious pig with a heart of gold, the priestess set on saving the world, and the silent protagonist. One weird thing with the silent protagonist though is that they create a backstory as to why he cannot speak, but then give him lines of dialogue anyway in the form of him writing notes. It was an odd choice indeed, but is emblematic of how dedicated this game is to sticking with JRPG conventions. Just like the story, the gameplay also has no real identity of its own. This is a rather basic turn-based JRPG, with no real interesting additions to differentiate it from other titles in the packed genre. Exploration is done via wandering around a world map, where random encounters will slow your progress, and upon entering towns and dungeons. Towns will only see battles during story sequences, though dungeons will also have you face random encounters. The battle system employed is very simple. You have the basic menu selections, such as attack, defend, use items, use abilities, and flee. Attack just does your basic physical weapon attacks. Defend lessens the amount of damage your party member takes. You can use items to help heal status effects and also use healing potions. Using abilities means that you use your magic abilities. And finally, using flee helps you escape from encounters. Your party is a little different in this game compared to some JRPG’s. You can have up to 100 party members, though not all at once. You have three party leaders, each commanding up to three party members. This helps you to customise your party as you see fit. Depending on your party compositions, they may qualify to have a bond, which essentially works as a stat boost. There is a strategy room that you can fill out with companions as well. Up to 12 party members can be added to the strategy room, which gives you stat boosts in battle, and those in the strategy room also level up. All of this sounds more interesting and involved than it actually is, which is unfortunate. Besides the few party leaders you gain throughout your travels, each of the “fodder” companions may as well be faceless NPC’s. None of them have more than a few lines of dialogue when you recruit them, and from there they just become tools for battle. This creates a distance from your team, rather than connecting with your party members like in other JRPG’s. A pixel art style is implemented here reminiscent of the NES era. Although I am fond of pixel art in general, I feel that Alvastia Chronicles is a poor example of that visual style. Character models are far too busy to the point of giving off a somewhat blurry effect. The same applies to the environments and, well, the game as a whole. There were sections where I felt like I was stuck, only to realise later that a cliff would be able to be walked up, denoted by a slightly blurrier texture to the rest of the cliff wall. As for the sound design, it is passable for the most part. Battle sounds, chat bubble speech and player actions have a rather generic JRPG flavour to them, which is fine. The soundtrack implemented here is in the chiptune style, though I found most of the tracks to be either dull, or just straight up annoying due to the amount the songs were repeated, as well as the tones of some of the rhythm tracks. 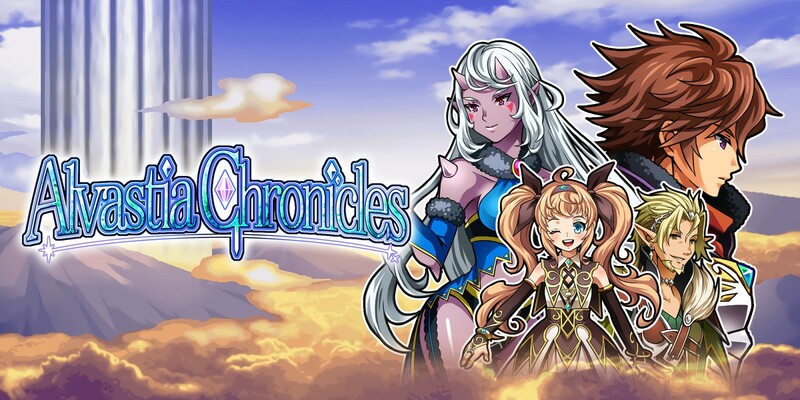 Alvastia Chronicles is a slave to JRPG conventions. It doesn’t reinvent the wheel, nor does it try to. Not every game needs to do something new, but unfortunately, in this case, the game come across as dull and uninspired in a genre brimming with quality competition. The art style is bland and obscured, the sounds are lifeless, and the story and characters are generic fodder. There is an interesting party system implemented, though that is not enough to save what is essentially a bland, by the numbers game ripped straight from the JRPG handbook.